C’mon, Who Really Wrote it? : David Grambs in 1965. 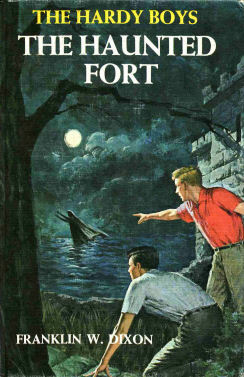 The year before he revised 6: THE SHORE ROAD MYSTERY, then in the same 1965 he revised 12: FOOTPRINTS UNDER THE WINDOW, the next year he revised 27: THE SECRET OF SKULL MOUNTAIN, and finally in 1968 he revised 29: THE SECRET OF THE LOST TUNNEL. So with this, his only original, we say good bye to Mr. Grambs. Up until now his revisions have scored either a 6 or a 9. Let’s see how an original does. Cover: Rudy Nappi. A lot of blue with only Joe bringing the usual red. A very nice nighttime scene with Frank and Joe typically staring at something scary. Is that really a ghost? Is the fort really haunted? Remember your Scooby Doo, boys and girls, and you meddling kids will solve the mystery in no time at all. Setting: Bayport and then New England. Where’s Fenton This Time? : He does not appear at all in this one. Which Chums Show Up? : Chet. Cameos by Callie and Iola. What’s Chet’s Hobby This Time? : He’s an artist. Good thing they are headed to an art school. Aunt Gertrude’s Dessert: She also does not appear in the book, evidently on a retreat to learn new pie techniques. Plot: Chet’s uncle is an instructor at a summer art school in New England, and he asks Chet and his friends to solve a mystery. Art work is being stolen, there is a mysterious Revolutionary War fort nearby, and there is gold treasure to be found. Review: Other than the silly Scooby Doo ghost, this is a decent mystery. The bad guys play rough, and in chapter XIX the bad guys sure talk a mile a minute about who did what through the book. It’s in a bucolic setting, with lots of red herring characters, and there are clues in paintings. But it’s not a great one either. Just OK.